They call the 2018 Chevrolet Trax a “small” SUV. It might be small compared to big-box SUVs, but it has tons to offer inside and out! The Trax is already becoming one of the most popular sports utility vehicles among critics and SUV enthusiasts. The 2018 Trax is agile and responsive and has an urban flair that fits right in with city life. It’s powerfully efficient and is contoured perfectly to be just the right size for those tight city parking spots. It also has tons of cargo room. The all-new 2018 Chevrolet Trax also offers all the latest advanced technologies that are geared towards both your convenience and safety. The 2018 Chevrolet Trax has a mighty engine. The standard engine is a turbocharged 1.4-liter 4-cylinder which gets up to 138 horsepower. The standard transmission is a 6-speed automatic. Even with all of this power, it’s extremely fuel-efficient getting 25 mpg/city and 33 mpg/highway. The 2018 Chevrolet Trax has seen many changes, updates, and new features for the 2018 model year. If you haven’t seen or driven one yet, don’t just take our word for it. Come down to our Carl Black Nashville showroom and come test drive one! The 2018 Chevrolet Trax has a small-displacement engine giving it a small-car-like fuel economy. With an EPA-rated 33 mpg/highway, critics marveled at how well it passed the 75-mph highway test, out-performing, even other subcompacts in its class. The 2018 Chevrolet Trax also gets from 0 to 60 mph quicker than other models, proving its turbo 1.4-liter engine is just as efficient while providing the fuel economy customers are looking for. With sharp acceleration, and competitive handling and braking performance, body roll is kept in check keeping the ride of a Trax comfortable, firm, and smooth. With its speed, maneuverability and quick acceleration, drivers of the 2018 Chevrolet Trax will be amazed. It’s clear this car-like SUV was built to impress. It can even boast a short wheelbase, combined with the shape and size of the Trax making parking a cinch. The Chevrolet Trax is so fun to drive, but there is only one way to find out. Come down to the showroom and see for yourself! The 2018 Chevrolet Trax has all-new standard and available entertainment and information technology. Any commute to work or a spontaneous day trip can be eased with the convenience of music and media on-hand. In every 2018 Chevrolet Trax model is the fun Chevrolet MyLink 7″ diagonal touchscreen infotainment system. This system features the following: AM/FM stereo radio with seek-scan functionality, 7″ customizable color touchscreen, Bluetooth streaming audio, compatibility with Apple CarPlay and Android Auto, and voice-activated commands for both radio and phone. You can have everything at your fingertips: music, podcasts, and audiobooks. And since you do, you’ll be glad the 2018 Chevrolet Trax comes standard with a 6-speaker sound system. With the 2018 Chevrolet Trax Premier trim, you can upgrade to the BOSE premium 7-speaker sound system and a subwoofer in the spare-tire well. SiriusXM Satellite Radio is another available feature that many have come to expect, and few car-buyers can live without. But the technology available isn’t just for fun. Safety technology is a primary focus in all Chevrolet vehicles. The new safety features available in the 2018 Chevrolet Trax include: blind-spot alert, forward-collision alert, lane-departure warning, and rear cross-traffic alert, as well as standard Rear Vision Camera, OnStar with 4G LTE, and a built-in Wi-Fi hotspot. Another safety feature is the theft-deterrent system ensuring further peace of mind. Convenience comes standard with keyless entry and remote start. Comfort is further enhanced with the 2018 Chevrolet Trax’s interior air conditioning and air filtration system. This keeps the air in the cabin fresh and clean, adding to the luxury-feel that many car-buyers crave. The 2018 Chevrolet Trax has been updated with the latest interior, and exterior features within the new Redline Edition trim package. This exciting Premier trim gains a standard sunroof, and the design features a contoured, less-boxy styling, making this model 2 inches narrower and 10 inches shorter than similar looking compact SUVs. The 2018 Chevrolet Trax’s ultra-compact dimensions don’t affect the spaciousness of the interior and cargo space. This subcompact SUV is Chevrolet’s compelling entry in the class. The LT model is gorgeous inside and out with 18-inch wheels and unique exterior trim. The exterior has the addition of three exterior colors: Storm Blue Metallic, Sandy Ridge Metallic, and Cajun Red Tintcoat. The new Redline Edition package includes: 17″ black finish aluminum wheels with Red accent stripes, all-season blackwall tires, black mirror caps, a black grille, black beltline moldings, black Trax badge with red outline, and beautiful jet black deluxe leatherette seating. 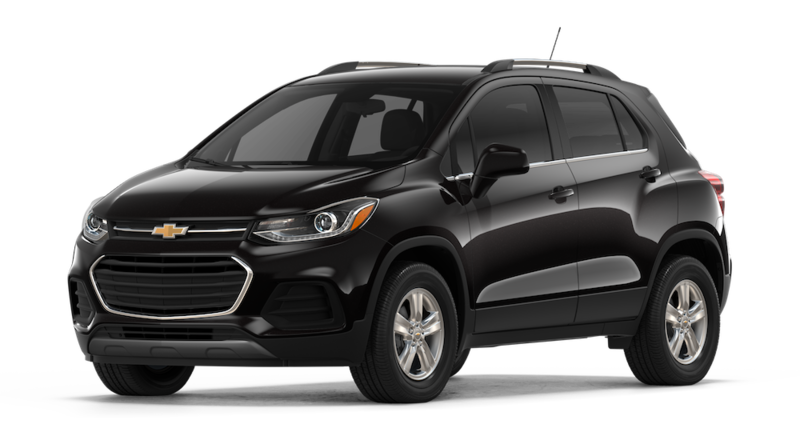 The 2018 Chevrolet Trax introduced a new sporty Performance Package, making it the sportiest version of the Chevrolet Trax yet. The new 2018 package emphasizes acceleration and power with its turbocharged, 1.4-liter engine that gets up to 138 horsepower. Mated to a six-speed automatic transmission, this is an energetic powertrain. Acceleration is surprisingly efficient for this type of vehicle. Drivers who get behind the wheel will always be pleasantly surprised when the Trax accelerates to 60 mpg faster than most other models in its class. The engine even out-performs many of the other sports utility all-wheel-drive models in its class. With this great little engine, you can get around town swiftly and smoothly. The feel of this ride is fun and exciting. The handling and braking of the 2018 Chevrolet Trax works well in both front-wheel and all-wheel drive, making it highly maneuverable. It also has an excellent turning radius, with sharp steering and little body roll around corners. This makes for an exceptionally comfortable ride. Here at Carl Black Chevrolet of Nashville, we deal in all kinds of vehicles, but we want to meet your specific needs. If you’ve been shopping around and still can’t find just the right sports utility vehicle, you should come to our showroom and check out the all-new 2018 Chevrolet Trax. We can’t wait to show it to you. At Carl Black Nashville, we want the customer to know we want what’s best for them. We know that customers are looking for sportiness, comfort, luxury, fuel-efficiency, and cargo room – not to mention, a great deal! We are certain the Chevrolet Trax is what you’re looking for. Our highly qualified dealers are excited to meet you and determine your needs. We look forward to telling you everything you need to know about 2018 Chevrolet Trax and answer any questions you might have. At our Chevrolet dealership, we know quality, and we understand how necessary it is to have an extensive inspection process. That’s why we are proud to be a Chevrolet dealership. We carry “Chevrolet tough” vehicles that you can put your full trust in.